In a large pot, add all ingredients except for fish and lemon juice and half of olive oil and bring to a boil. Boil over medium-high heat for 20 minutes. Add fish to the soup bring to a boil, lower heat and simmer for 30 minutes. When fish and vegetables are tender the soup is ready. Place the cooked fish on a large serving plate. In a large bowl place 1/3 of the vegetables, lemon juice, ½ of olive oil left, salt and pepper and with the help of a food processor mash the vegetables with the rest of the ingredients. Place the mashed vegetables back in the pot and give a quick firm stir. 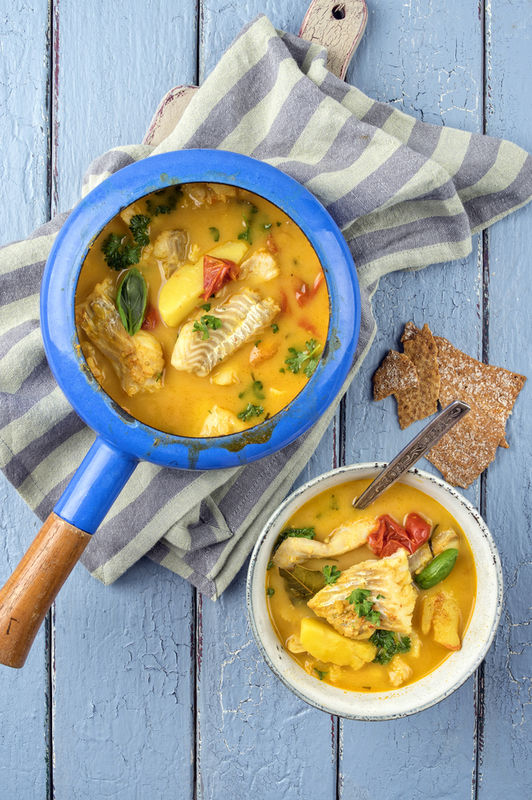 Serve either with the fish on a separate plate or cut into pieces and served equally with the soup.